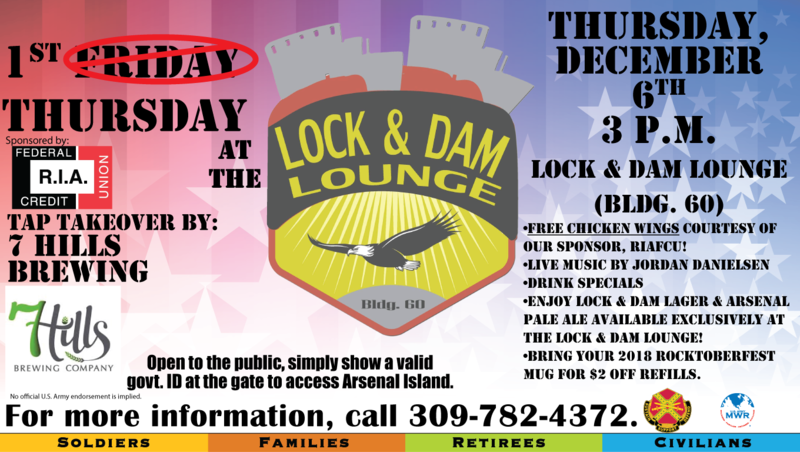 Date: Dec 6 2018, 3 p.m.
Join us at the Lock & Dam Lounge for First Thursday in December. This month we'll be featuring a tap takeover by 7 Hills Brewing Company out of Dubuque, IA. So grab your friends, co-workers, relatives or whoever else (it's open to the public) and come join us for drink specials, live music by Jordan Danielsen and fun! Get here early for free chicken wings courtesy of our sponsor, RIA Federal Credit Union! Call 309-782-4372 for more info.